Channel three alone would be enough to sell this amp to some of the world's most famous exponents of dirty riffing, but there's a whole lot more to the VH4 than that. Massive versatility. Stellar third channel is a world-beater. Clean tones could be more inspiring for the money. Over the last few years, Diezel amplifiers have become the must-have choice for some of the most high-profile rock guitarists on the planet. Behemoths such as James Hetfield, Billy Corgan and Matt Bellamy are just three of many who have embraced the four-channel versatility of German-engineered über-amplifier the VH4. 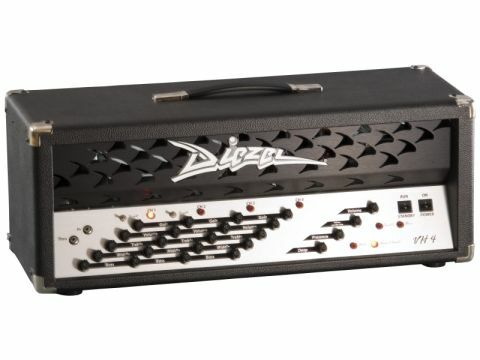 Diezel Amplification is largely the brainchild of electronics graduate Peter Diezel, who began dabbling in guitar amplifiers by modifying Marshalls in Munich in the 1980s and co-founded the company with fellow musician Peter Stapfer in the early 1990s.The first VH4 amplifiers were manufactured as early as 1994, but it has been in recent years that the profile of the company has really accelerated, with the high profile patronage of the aforementioned hard rocking luminaries. Both head and cabinet are immaculately tooled both inside and out. The front-loaded - thus easy access - sealed 4x12 cabinet is a bulky beast almost on a par with an Orange 4x12 and ideal for retaining the tightness and power of those gained out voices that the VH4 promises to deliver with aplomb. It has to be said that both head and cabinet make for an imposing physical presence and both are rather fearsome in weight terms. If you have a hirsute squad of burly roadies to lump around your gear then you are laughing, but if not, we would recommend that you consider smaller 2x12 cabinet. In gigging terms, a rig this powerful can be overkill even on larger club stages so a sensible degree of caution should be exercised before splashing thousands of pounds on a pro-level backline. "There really is as much dirt here as we can imagine that anybody might need, whether you are playing detuned grindcore or the blackest of Scandinavian black metal." With a potentially bewildering compliment of twenty-five knobs, eight push-button LED-equipped switches, two toggles and the power and standby controls, it is a good job that the front panel has been designed intelligently. Four angled parallel rows of controls are responsible for shaping the tonality of each of the VH4's channels, while global controls are sensibly kept to the right hand side of the panel. A quartet of 6L6 valves supply around 100 watts, while handy LEDs are present on the rear panel so that in the event of valve failure, each power valve has a corresponding fuse that when blown will cause the relevant LED to illuminate. Not only is this eminently useful, but the amplifier will also continue to function on two power valves, avoiding potentially embarrassing incidents where your guitar might otherwise cut out. However, when you do want silence, another handy feature is the front-mounted Mute button; great for avoiding those potentially noisy guitar changes. Overall versatility really is impressive; each channel has its own individual insert, while the effects loop is available in serial or assignable parallel flavours. The parallel loop can also function as an additional master volume when the send and return are connected with a patch lead. The level can be adjusted via the front panel's parallel mix control and the boost can then be engaged via the appropriate send 2 button. Rather than the traditional latching footswitch arrangement that players might have come to expect, floor-based switching needs to be carried out with an appropriate MIDI controller. The VH4 can supply phantom power to a MIDI pedal via a 5-pin DIN cable, negating the need for your MIDI pedal's PSU. Programming is relatively easy and is achieved via just two pushes of the Store button. The manual provides easy to follow instructions regarding programming and it is quick and simple to set up the channels, loop and inserts as desired, although whether or not you take advantage of this is entirely dependent upon the amount of external processors that you intend to use to alter the basic unembroidered voices of the VH4's four channels. So forget the considerable hype and the A-list endorsees, how does the VH4 perform up close? Channel one is the first stop for all things clean. While the gain control allows for some bite and break up to be dialled in, we found that the best performance was achieved by keeping this in check and enjoying the enormous clean headroom that the VH4 offers. It is immediately apparent that even with a quartet of 6L6s, the VH4 doesn't compete with the kind of character and touch responsive performance that a good Blackface Fender can elicit; however, the VH4's bold clean tone has a broad EQ range on tap and provides a solid platform for any modulation and delay effects that you might need to add. In any case, we have a sneaking suspicion that players who specialise only in clean and vintage crunch styles won't necessarily have the VH4 on their shopping list in the first place. Channel two is voiced for crunch and classic rock, reaching cranked Plexi levels of approximate gain and while not quite possessing the organic richness and chest-thumping authority of a vintage Marshall original, there are some high-quality AC/DC-a-like tones to be found here. One of our favourite sounds at the cleaner end of the VH4's sonic spectrum was also to be found on this channel, with the bright switch engaged, the EQ flat and the gain rolled back between nine and ten o' clock depending upon pickup output. This generates a really raunchy Fender-like tonality that seems at home with vintage single coils and bluesy noodling. So far pretty solid, nevertheless we were waiting for the real fireworks to emerge and happily, channel three delivers in spades. With a Seymour Duncan JB-loaded electric and the master volume wound up, the earth shook and polar ice caps melted as we kicked out some fat chords and evil riffs. The basic tone of this channel is juicy and explosive and it's such a rewardingly powerful high gain voice that you just have to dig in and rock out. As a lead or rhythm sound, channel three is superlative and even at huge volumes the integrity of the bottom end content is retained. The performance of the Diezel cabinet is exceptional, even when tested with a fat down-tuned low B rumbling away. Channel three is genuinely up there with the world's best and it remains musical and harmonically rich from overdriven indie rock territory right through to bowel-disturbing thrash metal filth. Channel four takes up where this leaves off but to our ears ends up sounding a little over-compressed and flabby in a chordal context, and really only high-octane shredding benefits from the extra gain. Channel three possesses the most musical lead voice as it allows for more dynamic response and feel to come through. That said, there really is as much dirt here as we can imagine that anybody might need, whether you are playing detuned grindcore or the blackest of Scandinavian black metal. And if it really isn't enough? Invite Herbert around for tea and sandwiches. If you are in band playing predominantly high-gain guitar of virtually any stamp and currently shopping for a high-end amplifier then the VH4 absolutely has to be on your 'must try' list. Big enough for any stage and with the kind of flexibility that can cope with that festival headline slot that your management are currently negotiating, the VH4 is built to handle the demands of world tours and aircraft hangar-sized venues. However, to drag this onstage at the Dog & Duck on open mic night would probably be a bit silly. Diezel's Einstein promises to distil some of the VH4's performance into a smaller package and we can't wait to check it out. But if you think that you can handle a rig on this scale, then the VH4's exceptional third channel alone might just have you sold. Rock, and indeed roll.